The shape of the nectary reminded ancient Greeks of a dolphin’s nose, hence the plant’s name, from the Greek word delphis for dolphin. The flower’s resemblance to a lark’s claw led to the common name of larkspur in England where numerous species and cultivars are popular in gardens and where annual Delphinium Championships are held for amateurs and experienced enthusiasts. The plant contains an alkaloid delphinine and is very toxic, even fatal when ingested in large amounts. In folk medicine extracts from larkspur were used against parasites, especially lice and nits in the hair, against the stings of scorpions and prevention of eye diseases. Larkspur is a serious threat to cattle, so cattle ranchers in the western United States avoid pasturelands until later in the season when the plant’s toxicity decreases. 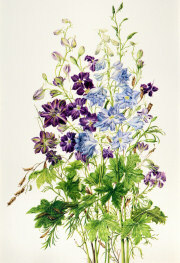 Delphiniums, nevertheless, are highly popular accents in a garden or in floral bouquets. © 2008 – 2012, milly acharya. All rights reserved.